My Art & my Sport worlds, were a divided battle ……. equally they were both huge passions, when I was immersed in one there was little time for the other. Each demanded its own commitment, and each got 100% of my attention. 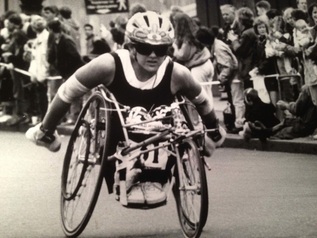 From around the early 80's I then became an athlete for 20 years where I competed in basketball for 8years and eventually got into wheelchair racing at international level for a further 8years. This took me to all corners of the world which included time trials, World Championships and two Paralympic Games. I brought home a silver and bronze medal. As an infant I was always keen on PE and sports at school, firstly learning to swim, then with the development of sports chairs, came basketball and racing. However it was after leaving school that I really got involved. I joined a local wheelchair basketball club. 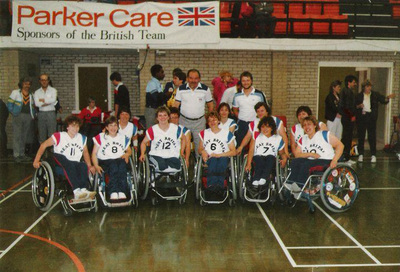 There were no women’s teams in the UK in those days, so I joined the men's. It was pretty tough playing alongside the men, but I loved the wheelchair skills and quickly lean't ball handling techniques. 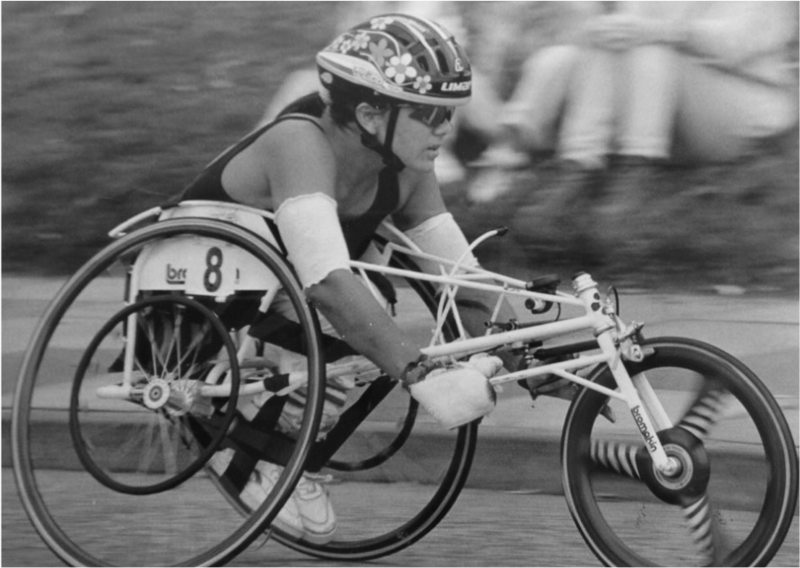 One sunny Sunday afternoon I remember turning on the TV, it was BBC2 and there was a girl in a racing wheelchair, she was Swedish, pretty blonde curls and she had just won her race. She was interviewed and spoke of the paralympics, this was the first time I remember taking notice of even hearing of the games. 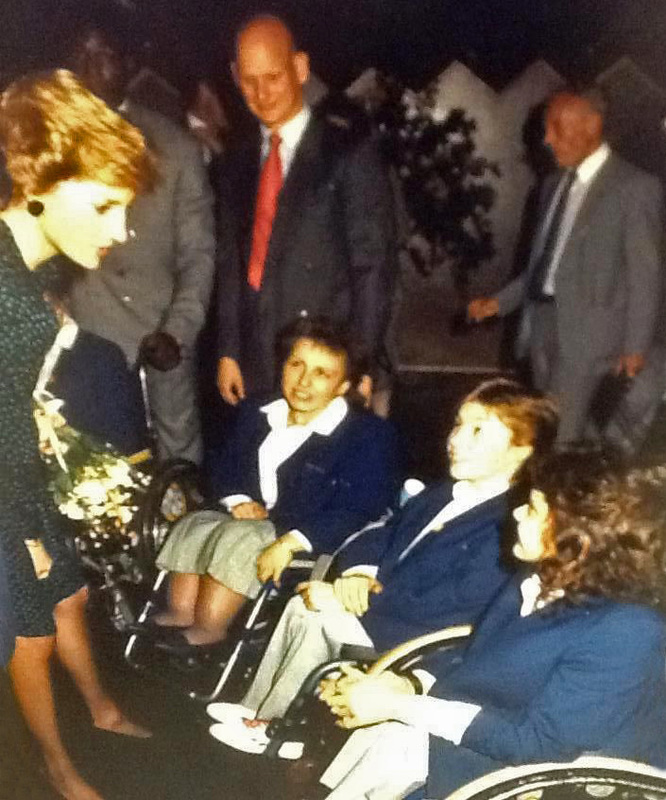 They were being held at Stoke Mandeville because Los Angeles had said they had run out of funds and could not host the games. 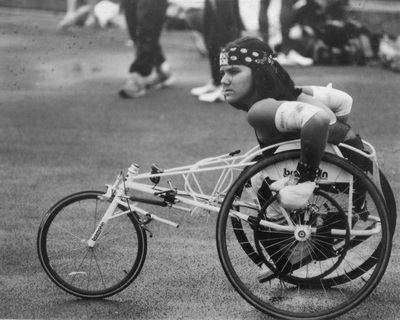 Stoke Mandeville stood in and made the offer not wanting to see the games go under. By 1990 I had completed my first London Marathon, I was training on the road daily, in the gym and on my training rollers twice a week or more when the weather was bad. My training was going well & I showed great promise. 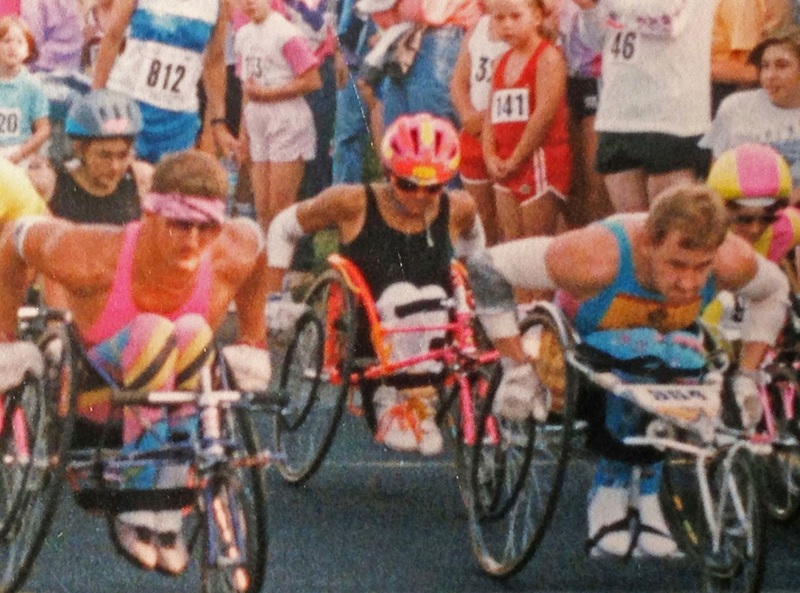 I enjoyed training & my based on the basketball regime I went into racing as a very fit athlete. I merely needed to improve technique and gain experience. I was light and toned, weighing in at 6.5 stone, I turned completely away from my art career to dedicate and focus on my athletics.I was in. 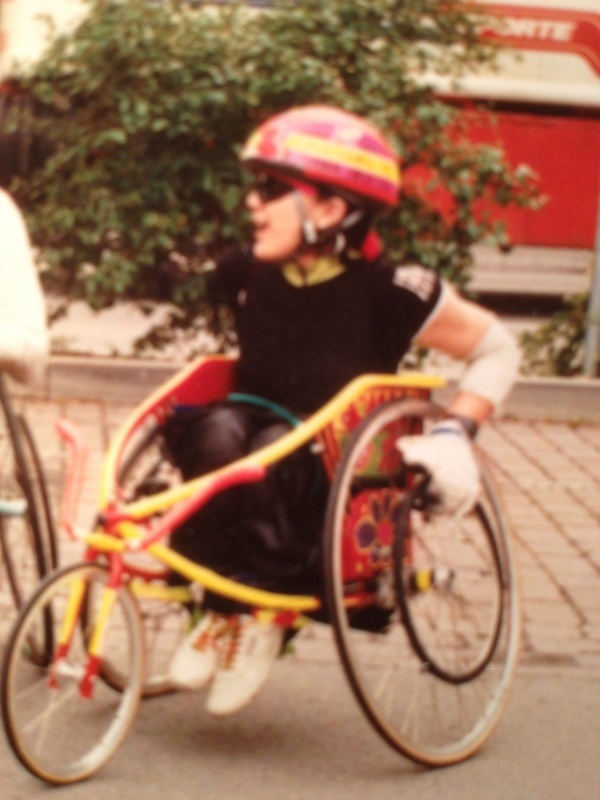 I was living an independent life in London, training everyday & racing every weekend. If there was not a race to attend then training weekends were set up for athletes to attend. 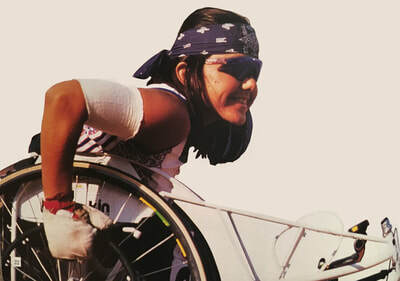 I threw myself into this world I had dreamed of, and began competing all round Europe, in the US and even as far as Australia. 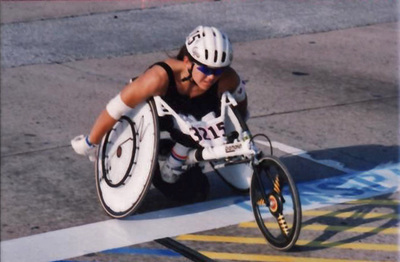 In 1992 I was picked for the Paralympic team again, but this time as a wheelchair racer. Competing in the 100, 200 400 & 800m and the Barcelona Marathon. 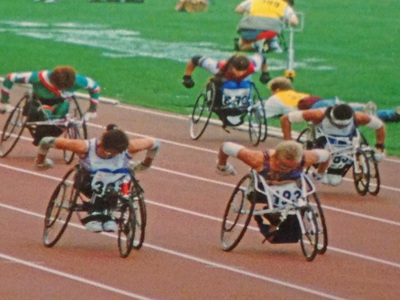 The 100m was my best discipline, & I was gutted to come 4th, having just been beaten by a fellow competitor however this was my first Paralympics for track, so I putting this down to experience I knew that by training hard I could improve on this performance. 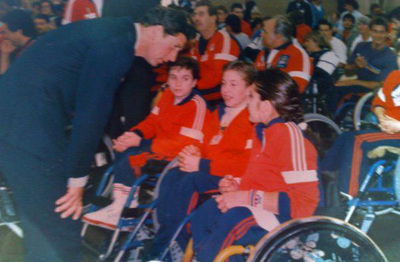 We medalled in the wheelchair female 4x100m relay winning silver for Team GB, which I am really proud of. 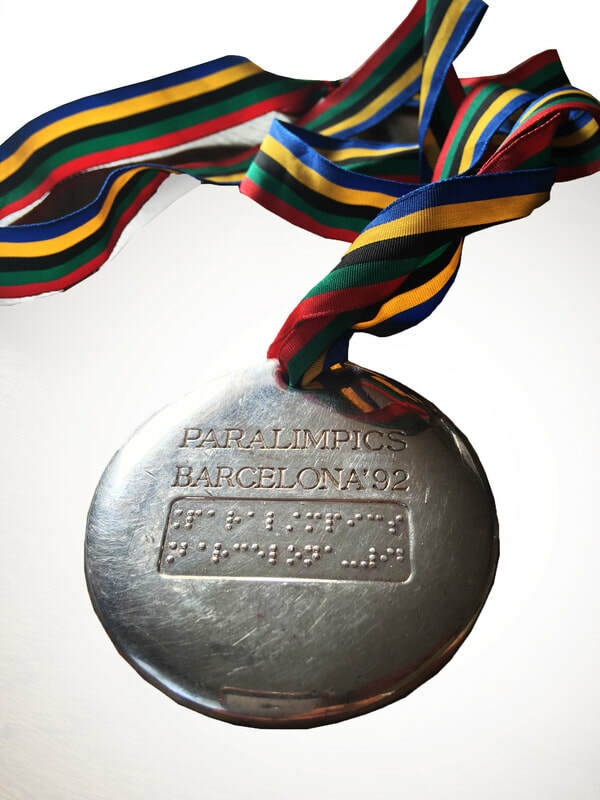 After the 1992 paralympics I decided to concentrate on the distances that suited me, the 100, 200 & 400m and cut down racing in the marathon events. This proved successful and my times quickly improved. Two years later. At the World Championships in Berlin, I came 3rd in the 100m, winning Bronze as an individual for Team GB. 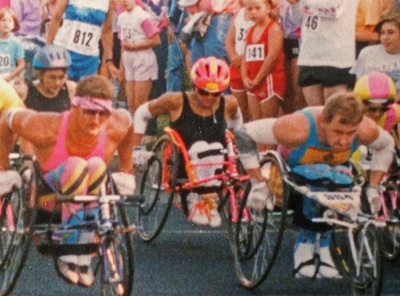 As a result of this I had 2 years to polish up my act with the run up to Atlanta Paralympics in 1996. To my disappointment I not selected …… I was gutted … Not only could I not believe I had not been selected I felt an injustice had been made during the selection process. International contemporaries of mine, friends & family felt that the treatment I received in the UK by the BPA was outrageous & disgraceful & should not have happened. I bowed out of the world of GB sport & competitive athletics, but trying has always been an important part and continues to be part of my daily routine. What can be seen as a sedatory life in a wheelchair is something I kick against and as a lifelong wheelchair user, independence is essential. Remaining fit and active is key & doesn't come without a certain amount of work and commitment. Ageing, bad weather & winter thrown into the mix doesn't make it any easier. However, once I am out, I love my cycle/ runs and aim to workout 3 or 4 times a week. That doesn't mean I always manage achieve this but exercise remains high up on my priorities. Having a shop, dogs and a generally a full 'life' can make it difficult to find the time, inclination & motivation. Fitness is for my mind as well as my body, if I do not exercise I can become irritable & it can affect my sleep patterns. I need my fix so cycling to and from the shop is perfect.